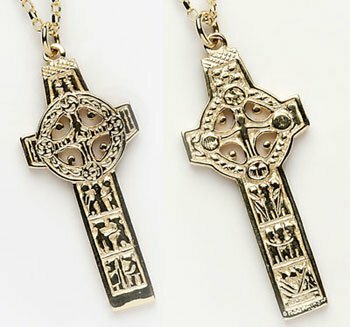 Beautiful Celtic Cross Pendant handmade in sterling silver or gold faithfully captures all authentic detail of the original Celtic cross of Scriptures found at the monastery of Clonmacnoise. Celtic Cross of Scriptures, to be found at the ancient monastery of Clonmacnoise on the banks of the Shannon, recreated in beautiful detail. 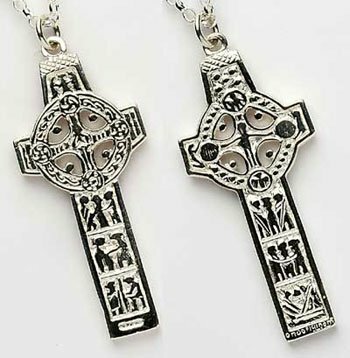 Handmade and hallmarked in Ireland this pendant is part of our Replica Cross Collection . 37mm high and 16mm wide. 7g silver weight. 7.3g gold weight. With 18 inch chain. Free shipping and 30-day money back guarantee. Celtic Cross of Scriptures, Clonmacnoise recreated in beautiful detail. Handmade and hallmarked in Ireland. Are like Rome reborn, Peopled sanctuaries. and a warrior with a sword, and between them a staff with leaves or flowers. which is known to have existed but the details of which are lost.